Learn more about Waves Platform on Knowledge base, FAQ & Support and Waves docs. How to create an account on Waves Platform (in 1 minute)? To buy, trade or store Angry Panda tokens you need to create an account on Waves Platform. 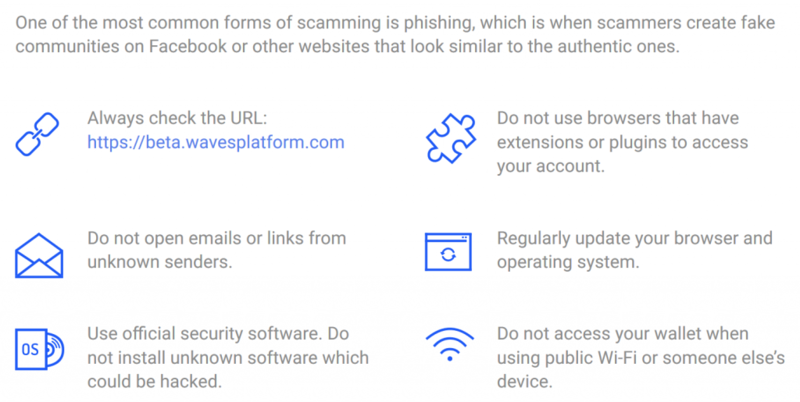 2) “Continue with web” or, as they recommend, download the desktop client from https://wavesplatform.com/ and then click on “Open desktop app”. 3) Choose your address avatar (one of the 5) and receive your public account address. 5) Add an account name and a password. Confirm the password. 6) You must save the secret phrase (SEED). It is crucial for accessing your account. Click on “Back Up Now”. 7) Insert the saved secret phrase (SEED). 8) Put the check. Confirm and begin. Also read and watch all our tutorials. If you followed step by step the guide How create an account on Waves Platform, you can now log in into your account, transfer some FIAT or cryptocurrencies from another exchange (like Binance, Coinbase, Bitpanda, Bitstamp) to the included wallet and start trading (buy or sell) any currency available in the Waves Decentralized Exchange (Waves DEX). – directly on Waves Decentralized Exchange (Waves DEX). – we guarantee a repurchase price at 1,000$ (XPAND), 1$ (UBEAR), 1€ (EBEAR). If you buy ROAR tokens during the pre-sale or ICO phase at 1$-512$, filling out our google forms, we guarantee a repurchase price at about 95% of the price paid. After the ICO you can also buy ROAR tokens directly on Waves DEX or by ordering on Angry Panda shop, but in these cases we can’t offer a repurchase price. The issue price, after the ICO, is 525$-1,000$. Log in to the Waves Client and use the search bar to find all the pairs with our tokens. For example, type the token name followed by / – in this way: XPAND/ – and you will see all the pairs with XPAND token. but you can also find trade orders in other pairs, like i.e. Waves and BTC, set by other traders. – B1ztQNRtRZFqAUjmWv7cmW9ncYVEQV2wkY5qAVvaMp85 for EBEAR tokens. 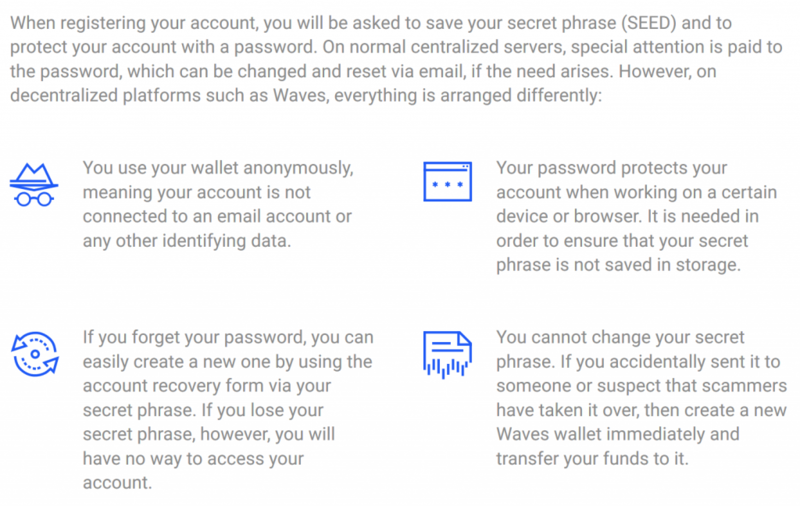 Waves Decentralized Exchange (Waves DEX) – since it is decentralized, you own your private keys and you retain complete control over your funds when trading ROAR and Angry Panda tokens or many other cyptocurrencies on the exchange. desktop wallets (Windows, Mac OS, Linux), mobile wallets (iOS & Android) and an online wallet, to send, receive and store your currencies. You can download the exchange with the included desktop and mobile wallets from the footer (bottom) of every page of this website. Waves NG is making the platform easier and faster. The Waves network has implemented a ground-breaking new protocol that will allow its blockchain to process thousands of transactions per minute. 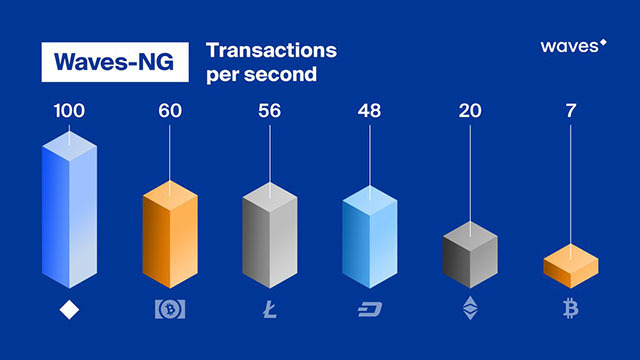 Cheaper and faster: look at the costs per transaction and transaction per second! ATTENTION: Don’t give your password, your private address or your secret backup phrase (SEED) to anyone! Never! If anyone has your your password or SEED, they can steal your Waves and tokens! Be careful and avoid inputting your wallet information on any resources. If you lose your SEED, you will have no way to acces your account. How many cryptocurrencies does Angry Panda project include? Angry Panda project includes 4 tokens: ROAR, XPAND, UBEAR and EBEAR. Each token has special characteristics that can adequately meet the different needs of our customers. For more details, look at Tokens page. Are there any rewards for the promotion of the Angry Panda currencies? Yes, you can get a percentage directly linked to the cryptocurrencies bought by your followers/investors – ROAR, XPAND, UBEAR, EBEAR tokens – with your referral code. Check the information on the Promoters page or contact us to receive more detailed information: info@angrypandacoin.com – Telegram Group. I have a business and I would like to introduce the Angry Panda coins as a payment method. How can I do? Sure, you can start using our tokens as payment method. Contact us to be added on our store locator, to show your potential customers where is your store and to include some useful information about your business and contacts. This feature will be available soon: info@angrypandacoin.com – Telegram Group. Can we promote our tokens and leasing pools, or sell on Angry Panda Shop? Yes, you can promote for free. Check Waves tokens and leasing pools lists page or contact us: info@angrypandacoin.com – Telegram Group. The sale on our shop will be available soon, you can start contact us to list your items or services. What is the purpose of XPAND? The main purpose of the XPAND tokens is to protect the value of your investments while trading on the exchanges and, also, to finance the creation of the Angry Panda Shop and Exchange. Furthermore it can be used as payment method for daily use. More details can be found at the XPAND chapter. Is XPAND just another stable coin like Tether, MakerDao or DGX? Absolutely no. You can not compare XPAND to Tether or other similar coins. 2) For XPAND tokens, instead, we just pay 1,000$ for your tokens if you want to sell to us through our rebuy system. For the upper limit we set a very high amount of XPAND tokens at 1,100$ on the DEX, allowing about a 10% price fluctuation. This doesn’t means that you can’t find XPAND at 500$ on the DEX. We just guarantee you 1,000$ only when you want to sell to us! 3) The upper and lower “limits” said before only applies to the pair with dollars (XPAND/USD), but you can also trade XPAND without any limits of value vs all the other existing coins, so the value of XPAND tokens can increase without any limit. i.e it can be worth 100 BTC as well as 0.000001 BTC. But in the second case you can always sell it to us for 1,000$! Why the lower and upper limits? The aim of the minimum price of 1,000$ is to guarantee its value without worrying that it may fall in price, as often happens with other currencies. For this reason, we guarantee to investor the possibility to get back almost the whole investment (around 95%). The upper limit at 1,100$ is set only to protect investors: it remembers people to be prudent while investing and don’t overpay a coin, to avoid falling in the trap of pump and dump. However, as we have already said before, you can trade XPAND vs any other coin without any limit, at your risk. Keep in mind that if you exchange XPAND with currencies other than the dollar, the minimum and maximum limits are not there, and therefore it is possible at your own risk to trade XPAND at values ​​significantly higher or lower than the issue price. But in the second case you can always sell it to us for 1,000$! Why investing in other coins and not in XPAND, UBEAR, EBEAR? Definitely, why should you invest in a coin that could lose all the value when you can invest in XPAND / UBEAR / EBEAR that ensure almost the whole value (around 95%)? This is a fundamental point because our tokens allow investors to trade safely. Furthermore you can trade, at your own risk, without any limits vs any other coin. We just have to think about it a little and understand the enormous usefulness that this project would bring in such an unstable market. If I want a stable currency I just use EUR or USD... or not? EUR and USD are static currencies and can’t increase their value. Instead, our coins can increase their value without any limits but also guarantee a repurchase price at about 95% of the issue price. For this reason, more than stable cryptocurrencies, our tokens are “safe cryptocurrencies”. We repurchase XPAND / UBEAR / EBEAR cryptocurrencies at 1,000$ / 1$ / 1€, while the other coins don’t protect you against the risk of losing almost all their value. This is a foundamental difference! And how can they increase in value? Let’s suppose a down trend where all coins lose their value. To avoid the loss of value people would move their investment from BTC / ETH / XRP / WAVES to a better currency. Our tokens, sold at 1,050$ / 1.05$ / 1.05€ can never go below 1,000$ / 1$ / 1€. Being “safe” over 1,000$ / 1$ / 1€ they could attract more investors. In this case, demand will raise and price too. What happens if the price of the Angry Panda tokens goes under 1,000$, 1$, 1€? It could happens that the price of the Angry Panda tokens goes under 1,000$, 1$, 1€ on the exchange, i.e. if someone decides to buy a large amount of tokens and sell them soon at low price. This doesn’t mean at all that we will not accept your tokens at 1,000$, 1$, 1€. When we sell our tokens, at predefined times, we set a buy order for the same amount of tokens sold. Thus just be patient and wait some minutes for the necessary coverage through our repurchase orders. Or contact us! What is the purpose of UBEAR and EBEAR? The main purpose of the UBEAR/EBEAR token is to provide a fast, cheap and secure payment method for USD/EUR transactions in the daily use. More details can be found at the UBEAR and EBEARchapters. How do you guarantee a repurchase price for UBEAR / EBEAR at 1$ / 1€? When we sell our tokens, at predefined times, we set a buy order for the same amount of tokens sold. Thus just be patient and wait some minutes for the necessary coverage through our repurchase orders. What is the purpose of the ROAR ICO? The main purpose of the ROAR ICO is to raise funds for the Angry Panda project and make it known. Therefore, the initial offering will start at very cheap prices. It is a great opportunity to have a strong return on investment and it represents, in concrete terms, our gratitude to all those who will support the Angry Panda project since first steps. More details can be found at the ROAR chapter. ROAR ICO, bounty program, financial coverage. Is it all true? Practically ROAR is the ICO of XPAND and it works like a bounty program. – you to get a very high return on investment. ROAR token is offered at really cheap prices (1$-512$) during the pre-sale and the ICO, as the initial coin offering of the XPAND token that is sold, instead, at 1,050$. It is also distributed with airdrops and through bounty programs. The circulating supply at the end of the ICO amounted to less than 2,000 ROAR. Every 25 XPAND sold by us, 1 XPAND token will be available to be swapped 1:1 vs ROAR tokens. 25 XPAND sold * (1,050$ our sale price – 1,000$ as reserve to guarantee our repurchase) = 1,250$ reserve to cover the swap > 1,000$ the cost of the swapped XPAND. This guarantees the financial coverage. Also, if you buy ROAR tokens during the pre-sale or ICO phase, we guarantee a repurchase price at about 95% of the price paid. So it is totally true that if you buy 1 ROAR at 1$, and it will be swapped 1:1 vs 1 XPAND after the ICO at that condition mentioned above, you will get a minimum +99,000.00% return. This because XPAND price will be 1,050$ and XPAND minimum price guaranteed by us will be 1,000$. Why should I buy ROAR during the ICO? Can you give us a practical example? If you buy during the ICO “Round 1”, you buy 1 ROAR at 1$. For every 25 XPAND sold by Angry Panda project, you could swap 1 ROAR tokens vs 1 XPAND token. Since 1 XPAND token is sold by us at 1,050$ and bought at 1,000$, it means you have paid just 1$ to get a return of 1,000$ or more. What happens if you need your invested capitals back immediately and can’t wait anymore for the swap? If you purchased ROAR tokens during the pre-sale or ICO phases, you will receive back 95% of the price paid, in this example 0.95$. If you bought ROAR tokens directly on Waves DEX, instead, we can’t offer you a repurchase, cause we can’t check the price you paid. So basically everybody who bought into the pre-ico will have to wait until 25 XPAND are sold to change only 1 of their ROAR? Like if you invested 100$ in Stage 3 and got 25 ROAR, in order to exchange them all you’ll have to wait until people buy XPAND worth roughly 650,000$? Yes, it is. You have to wait people buy XPAND for i.e. It is true that you have to wait, but don’t forget the really high return on investment: from 100$ to 650,000$. And if you purchased ROAR tokens during the pre-sale or ICO phases, you will receive back 95% of the price paid, in this example 0.95$. So it’s up to you whether to wait or not. However 1:25 indicates only the ratio, but you can start swapping your ROAR vs XPAND one by one (or 0.1 ROAR every 2.5 XPAND sold, etc.) you don’t need to swap all in a single time. If you swap the first one, be sure you’ll swap the next faster, because people will begin to believe in the project more. Remember that if you buy at 1$ we can guarantee a repurchase at 0.95$ (if bought during the pre-sale or ICO phases), but you can sell ROAR tokens at much more to the other traders. Why? Because there are limited amount of ROAR circulating (less than 2000 at the end of the ICO). So many investors would buy to swap vs XPAND (worth 1,000$ or more). In any case don’t forget that with the repurchase price at around 95% of the sale price, if all things goes bad, you could “lose” a maximum of 5% of your investment. But all the other coins lose much more in a single day. So we don’t think that risking only 5% max, in all the life of the coin, is so much. Is ROAR just an ICO? What is its real value? No, ROAR isn’t just an ICO. It is a real coin and its price could raise “to the moon” if you consider its max supply. In fact ROAR token has a supply fixed to only 100,000 not-reissuable tokens (max supply). It means that the supply is really limited and its availability can not increase. Considering that Bitcoin supply is 21,000,000 (210x) and XPAND supply is 2,600,000 (26x), the price could potentially go also to 25,000-30,000$ or much more. Who knows? If you didn’t find the answers you was looking for, don’t hesitate to ask a question: we are at your complete disposal for further clarification.